Summer times on EVA and FROTA AZUL buses apply 1st July to the second weekend of September, then winter times until 30th June every year. Buses DO RUN on all public holidays to Sunday times, but many routes have very little service. Please also read the the general guidance notes as bus operations here in the Algarve may be a little different from where you live. For a quick summary of the buses at the main towns only, click here. Click here to view the complete timetable Faro – Almancil – Quarteira – Vilamoura – Albufeira – Lagoa – Portimão – Lagos, including fast services Faro to Lagos and Albufeira to Lagos. Click here for the complete timetable in the opposite direction Lagos – Portimão – Lagoa – Albufeira – Almancil – Faro. The services between the coastal resorts consist of several different, overlapping, routes. The buses do not carry route numbers! I have done my best to indicate what connections there may be. However it is my experience that connections are NOT usually held for late running buses. Click here for the times of buses along the eastern coast of the Algarve. Do the buses run every day? Most of the buses along the coast do not run at WEEKENDS or on PUBLIC HOLIDAYS. SCH – runs on SCHOOLDAYS only ie will not be running in July and August nor during Christmas and Easter breaks. Many buses along the coastal routes are routinely 10 - 15 minutes late. The schedules are rather optimistic and delays occur even at weekends. I have experienced many delays eg: from Faro to Albufeira (15 minutes late arrival), Albufeira to Portimão (35 minutes late arrival) and Lagos to Albufeira (10 - 15 minutes late arrival almost every journey). I would not trust any connection of less than 15 minutes. If you have a vital connection eg for a flight at the airport - take heed! These delays are almost entirely due to traffic congestion in Portimão and Faro. Buses are not normally held for late running connections. Local buses generally run on time but, the longer the journey, the more likely you are to be delayed. Buses between Faro and Albufeira via Vilamoura usually keep fairly well to time. During high summer (August) there is often severe traffic congestion in Albufeira, which delays buses including local routes. A – At Faro Bus Terminal the TRANSRÁPIDO bus leaves from inside the terminal building. Most of the other buses towards Quarteira, Vilamoura and Albufeira leave from the stop immediately outside the bus station entrance on the same side of the road, but check on the departures board to be sure. You must buy your ticket from the ticket office inside the terminal building before boarding your bus. If you have time to wait for your bus, avoid the disagreeable café/bar inside. There are two or three much better establishments across the road, with a McDonald’s and other fast-food shops about three minutes walk away. C – Olhos d'Agua. If you are visiting the beach, get off the bus at CANAS.All buses from Albufeira stop there two minutes after Olhos D'Agua, towards Albufeira two minutes before Olhos D'Agua This stop is a lot nearer the beach and the big hotels. About 50 metres from the stop you will see a road going off down a hill at a roundabout. The beach is about 400 metres down this road. There is NO PARKING down there, unless you are willing to pay €1.15 per hour. It is a nice beach though. D - Aerias São João - this stop is where ' The Strip' crosses the main road, near Jinkies bar. The bullring is nearby. E - Continente/Modelo shopping centre (the stop is called Avenida dos Descobrimentos) - for buses to and from the Vilamoura direction this is the nearest stop to the old town area of Albufeira. DO NOT STAY ON THE BUS ALL THE WAY TO THE BUS STATION, which is a mile/1.6km from the old town. From here it is about 6 or 7 minutes downhill walk into the old town - the EVA buses do not go there. See this page for more information and a map. 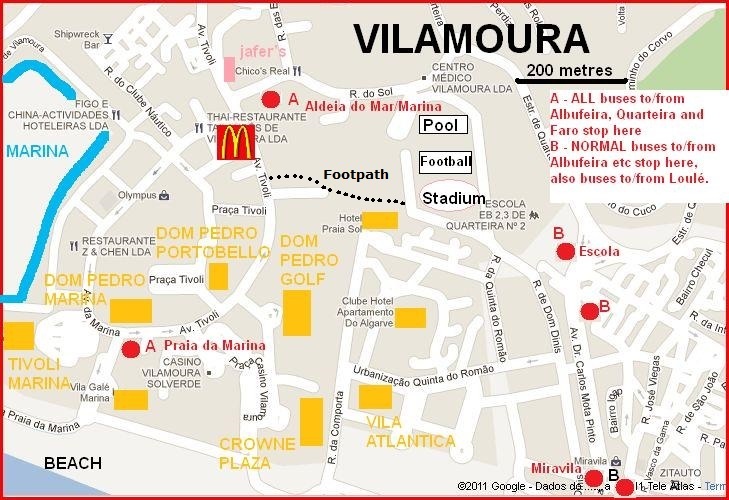 F - The Albufeira Bus Terminal is on the north edge of town and a mile/1.6km from the beaches etc. If you are coming from the Portimão/Lagoa direction (except on the buses that run via Vale de Parra) you will need to take the local GIRO bus for the last leg of the journey, take taxi or walk. Separate ticket needed. More information here. Buses from Quarteira, Vilamoura and Olhos D'Agua stop a few minutes walk from the old town at the Continente Albuferia Shopping centre. G – Algarve Shopping (Vale Verde) This stop is outside the ‘Algarve Shopping’ mall and close to the Albufeira Retail Park. Warning - if travelling from Albufeira or towards Guia you will have to cross a VERY busy main road. There is no crossing as such, but there is a 'no steps' footpath over a bridge. It's rather a long way round but much safer than trying to cross the road. The website of the Algarve Shopping Mall is here – there is currently nothing in English. There is a free bus on weekdays in summer from various hotels in Albufeira and Olhos D'Agua - click here for details. H – Armação de Pera bus stops are a bit complicated. There is a bus 'terminal' on the Via Dorsal (the main road through town) but it's just a couple of bus shelters, no office or anything. I have a map here. All the buses towards Lagoa, Portimão and Lagos stop there, after having gone past it on the other side of the road and nearly 400 metres in the wrong direction! ALL buses to and from Silves and Alcantarilha Estação stop only at the ‘terminal’. There is also a stop outside the campsite on the road to Alcantarilha. Local buses stop there. Sorry about all that - map. Also, the published timetable for some buses refers to a stop at the Hotel Garbe - this is now the Holiday Inn. Local buses no longer stop there. Long distance services operated by Rede Expressos and Renex stop at the 'terminal' on Via Dorsal. Some of those long distance trips also stop at the Holiday Inn Hotel on the seafront. Check when booking. J - In Porches, all buses stop on the N125 just outside the village, but only those running via Senhora da Rocha actually stop in the village centre. K – Portimão has an outdoor bus station. All 'regional' buses start and their journeys at stops along the Avenida Guanaré, by the river near Largo do Dique. Plan here. The local buses also stop elsewhere in town, according to route. In Portimão, Transrápido buses stop only in Avenida Guanaré by the river. Local 'urban' buses stop a short distance away in and near the Largo do Dique. Long distance buses (coaches to UK readers) e.g to Lisbon and Seville now use the new bus station out of the city centre. Information here. For more information including local connections etc please click here. L – Praia da Rocha bus stop for EVA services is near CLUBE PRAIA DA ROCHA in the AVENIDA DAS COMUNIDADES LUSIADAS. This is about 300 yards from the Hotel Jupiter, down on the main road by the roundabout. The stop is at the same location as the city ‘VAI e VEM’ bus stops called Clube Praia da Rocha. M - at Alvor this bus stop is at the roundabout/traffic circle (rotunda) just outside the centre of Alvor. All buses use the same stop. Buses cannot enter the village as the roads are too narrow. At the time of my last visit there were no current timetables on display. Z - to and from the Lagoa direction, these stops are the nearest to the old town area of Albufeira which is about 5 minutes walk. The fast buses do NOT stop here. The Avenida do Ténis stop for buses towards Galé, Armação de Pêra, Lagoa and Portimão is outside the school 100 metres from the roundabout. The Rua 1 Dezembro stop, for journeys into Albufeira, is close to Merlin's Bar on the corner at the statue of Saint Vincent. The bus comes up the hill from the marina, then goes past the Rocamar Hotel and along a narrow little road just before that stop. NB as of 13th March 2019 the Ria 1 Dezembro stop is closed owing to long term roadworks. Buses will stop on request nearby in Avenida do Ténis. INT – Interurban Bus. Also, note NOR = ‘Normal’ DIR = ‘Directa’ – these are the two sets of local buses between Albufeira and Faro. They take slightly different routes – for more information click here. They do NOT have route numbers as in most of Europe. AL– Albufeira - Lagos DIRECTA fast service (Linha Littoral) – this express service stops only at the places shown, also outside the Hospital in Portimão. TR – Transrápido – this express service stops only at the places shown plus some other locations in the city of Faro. Buses carry 'TRANSRÁPIDO' sign on the front. I have a scanned, printable copy of the timetable here.